It’s likely that most people reading this will have already seen either the original story on openbookstoronto.com last week, or a version of it referring back to that original list of “DAVID BOWIE'S TOP 100 BOOKS”. There have also been numerous suggestions of a Bowie Book Club to tackle each of the 100 volumes. However, there was a problem with that particular openbookstoronto.com feature in that only 75% of the books were actually listed! For anybody planning on completing this epic voyage of discovery, we’ve listed every single one of the 100 books here (in no particular order) for your reference. You may have also noticed the two chaps in the middle of our montage. 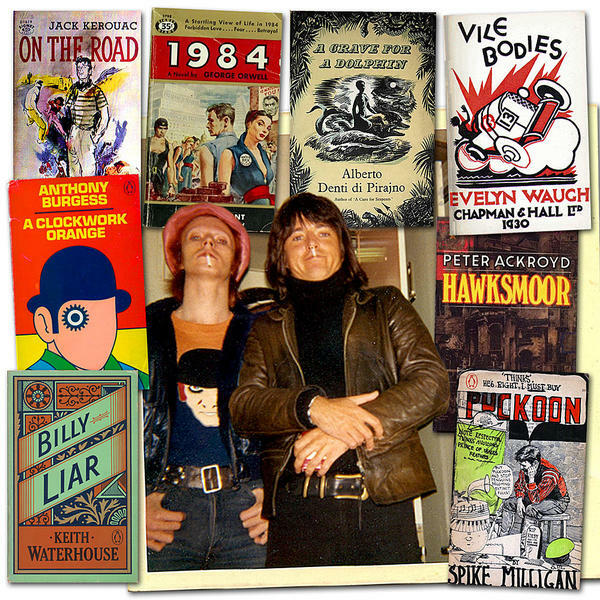 Well, it’s none other than David Bowie sporting a Clockwork Orange T-shirt (the book by Anthony Burgess is in the list) with his old chum, George Underwood. George kindly supplied the previously unpublished photograph, which according to him was taken aboard Amtrak somewhere between New Orleans and Chicago on the first US tour in 1972. And so, on to that COMPLETE list of David Bowie’s Top 100 (count 'em) Books.